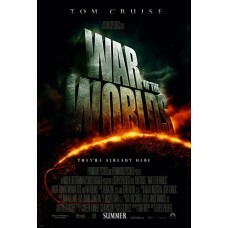 War of the Worlds Movie Poster 27 x 40. War of the Worlds is a 2005 American science fiction technology disaster thriller film and a loose adaptation of H. G. Wells's novel The War of the Worlds, directed by Steven Spielberg and written by Josh Friedman and David Koepp. It stars Tom Cruise as Ray Ferrier, a divorced dock worker estranged from his children (Dakota Fanning and Justin Chatwin) and living separately from them. As his former wife drops their children off for him to look after for a few days, the planet is attacked by aliens that come up out of the ground (loosely based on H. G. Wells' Martians) driving Tripods and as Earth's armed forces are defeated, Ray tries to protect his children and flee to Boston to rejoin his former wife. The film was shot in 73 days.